Musical Horns™ Are Easy To Install To Produce Sound Of Up To 120 Decibels. Musical Horns™ are used with 12-volt vehicles. Choose from a variety of models that play different sounds. Music Time™ - Dixie / On The Road Again, La Cucaracha / Mexican Hat Dance, and Wedding March / Hava Nagila are engine compartment-installed horns that deliver true musical instrument sounds. 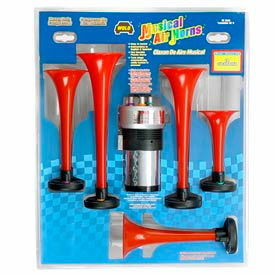 Musical Horns™ come in a complete kit with durable plastic trumpets and heavy duty maintenance-free compressor. 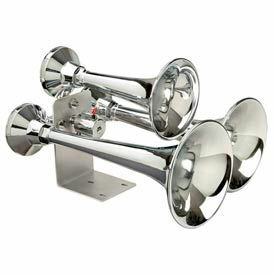 Truck Horns Provide Heavy Vehicles With A Loud Device To Alert Other Drivers. Truck horns can be piped through the compressed air brake system of the vehicle. Cannon Ball Express Truck Horns™ Electric Solenoid are ultra powerful horns constructed of three triple chrome plated trumpets. Available in 12- and 24-volt electric solenoid, including a lanyard-operated model.Challenger™ DD Roof Mount Air Horn can withstand extreme weather, providing years of dependable service. Siberian ExpressModels give any truck the powerful sound of a train air horn.